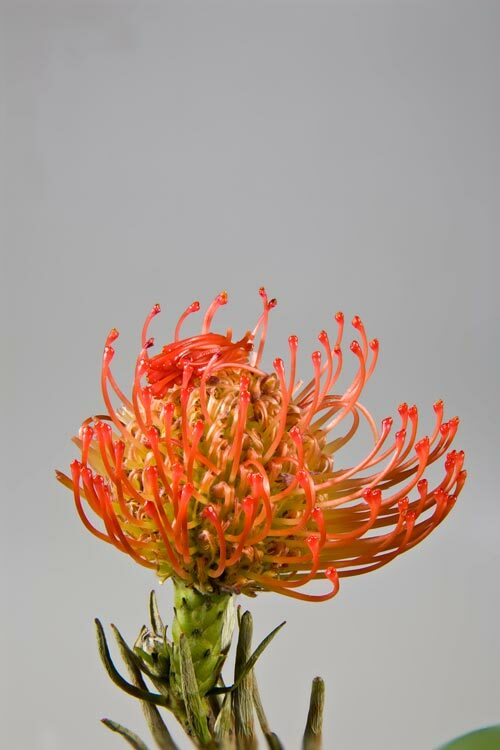 Special Project 1: Protea Chop! This project was a lot of fun. As you can see from the big image above I created a scene that took quite a bit of planning but was lots of fun in the end. I call it Protea Chop because, well, they are Protea lumberjacks. 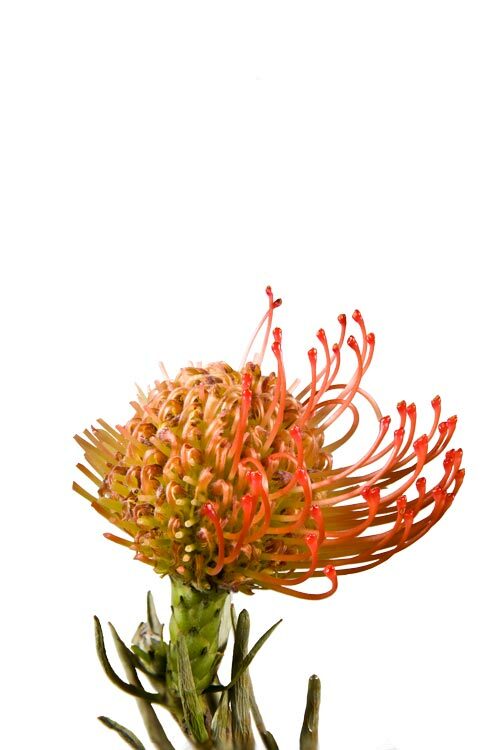 The Protea comes in a variety of colors from red, yellow, white, orange, green, purple, blue and pink. I had no idea, I only had knowledge of the red variety as I had seen some in Hawaii and when I needed a project for my MA in Digital Photography program at Savannah College of Art and Design I for some reason gravitated towards a flower-based project and the Protea was one of the flowers I found at a local florist. So I chose the Protea and figured I could use my little lumberjacks to harvest the items that are, for lack of better description, the petals. So I started with these little figurines. They are intended for use in model railroad sets to build a scene. But I used them to play with scale. 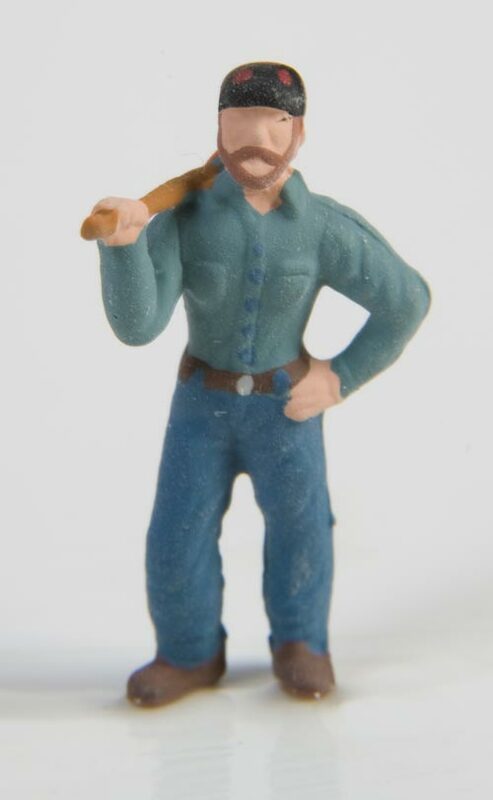 I photographed about 15 different lumberjacks in different angles. I wasn’t too concerned about totally filling the frame with each guy since I didn’t know if I would be able to use the natural shadow or not (I didn’t). 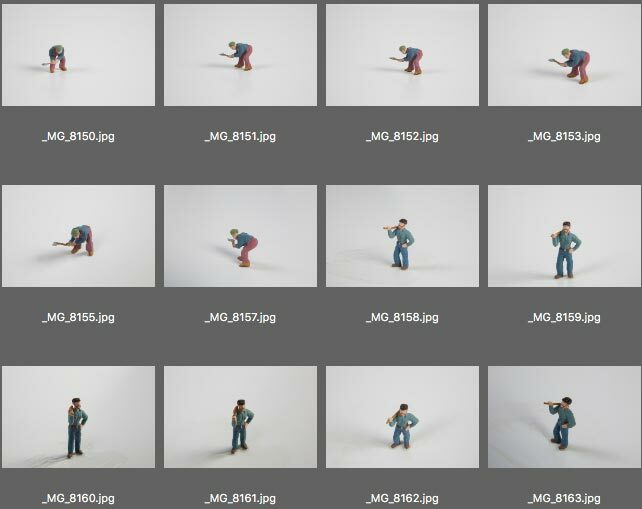 This grid view from Adobe Bridge shows several of the different poses I got from a few of the little pieces. This next photo of the wheat field was used as the base image, or the background. I wasn’t too concerned about resolution since I knew this would be in the background and that I was going for a shallow depth-of-field sensation. So I stretched this image all the way from about 3,000 pixels wide to over 7,000 pixels wide to accommodate the horizontal format of the final piece. 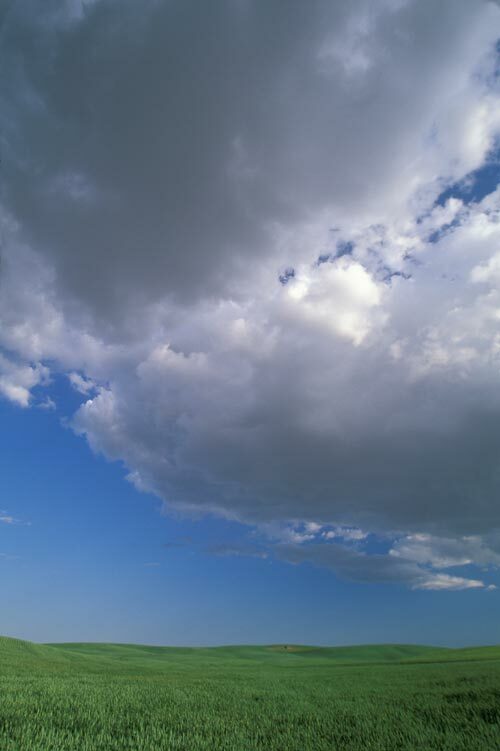 I also cropped out the clouds as the field was the important part I was going for. The perspective I chose was to have a point of view that was looking slightly downward on the ‘jacks. 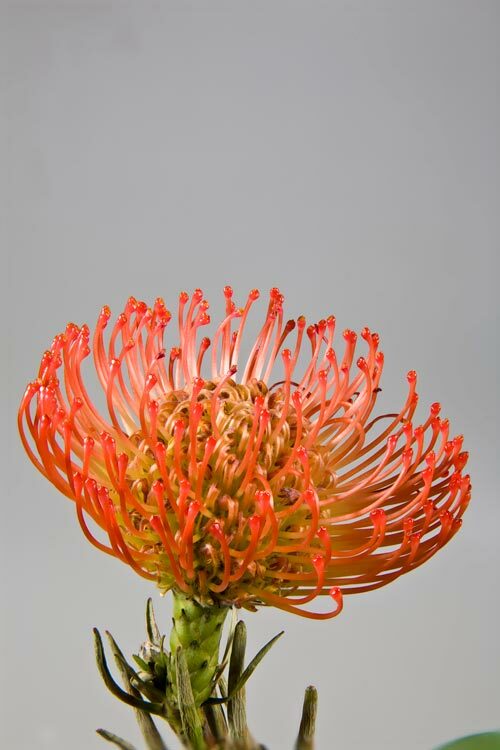 This is the shot of the original Protea. I only bought one. So I wanted to take care of it and I photographed it right away after purchase. I then chopped off the red petal things and in this image I started stacking them like logs. 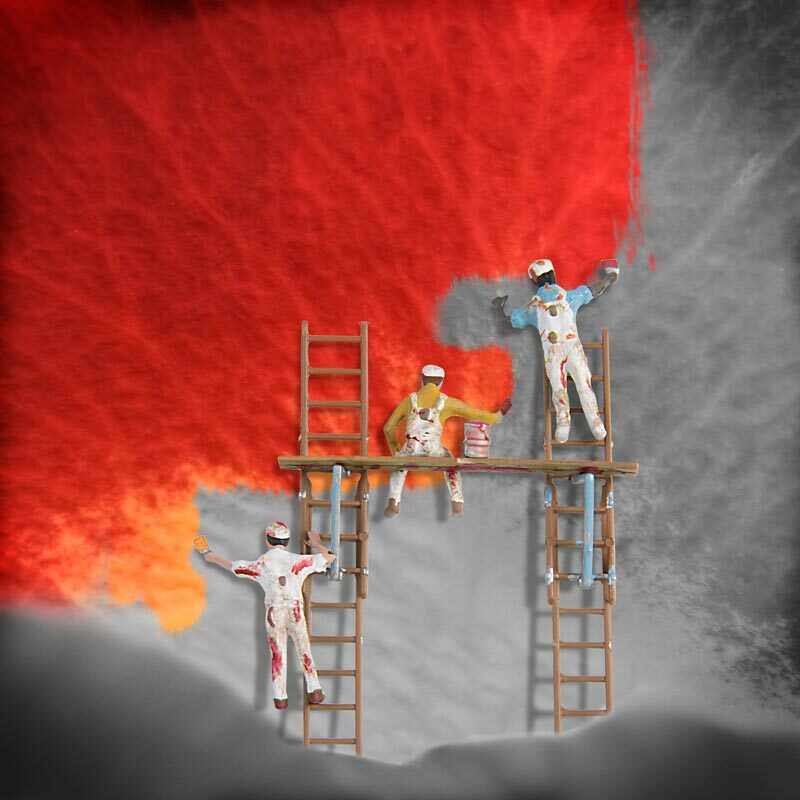 I didn’t end up using this particular image but it just shows the ideas I was thinking as I created this composition. 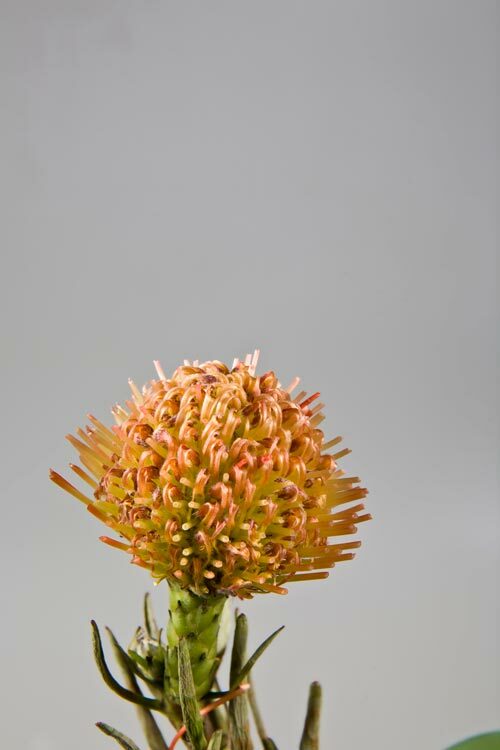 And then finally, there’s the Protea with all the petals chopped off. This is the half-chopped image I used in the final piece. And it shows the extra work I did in Photoshop to cut out the flower from the background. This was way before luminosity masks were thought of and while I still did OK selecting the gray and getting rid of it, there was still some significant cleanup to do. Nowadays I’d just pop more light into the background and make it pure white. Easy peasy! Here’s the cropped version of the field image. It’s also blurred to give the idea of shallow depth of field. And here’s the first two rows of Protea. It’s the same flower over and over, just blurred more and more as it got further and further back. And the second to last row to be inserted. Also slightly more in focus. And finally, the third row with one completely bald, one half-chopped, and the other with just a few chopped, they’re just beginning really. But still no ‘jacks. And finally, the end result. I also darkened the sky a bit to keep the eye on the foreground flowers and lumberjacks. All compositing was done in Photoshop, probably CS5 if I remember right. It was a while ago, way back in 2008 to be exact… Time really does fly! This was done as a class project for my studies at SCAD and here’s one more image that I did for the same assignment. It’s painters coming along with a “hue brush” and painting in the color. I took a macro image of a rose petal and then created masks to make it feel like the paint/color is being painted on. I created the shadow to make it feel like it’s a structure that the guys are leaning against. I also painted the strokes on the fella’s overalls. These photos were mentioned in the October 25, 2018, episode of the Master Photography Podcast. All images and text © Brent J. Bergherm. All rights reserved. 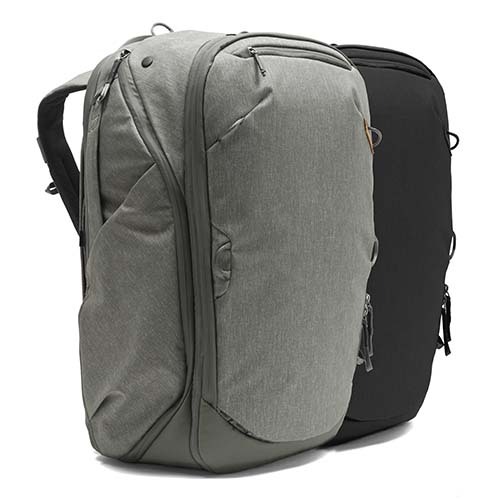 Wow, the new Peak Design travel line is now ready for pre-orders. (Regular orders starting in 2019). I know I want one, I’m inclined to say I want the “Sage” color, but it really needs to be more green and sage like, so maybe black. How about you? I am a photographer and educator and I love helping others improve in their photography. Thank you for letting me be a part of your photography journey. Sign up now for all the latest news, info and inspiration. Oops, something happened, please try again. I respect your privacy and take protecting it seriously. Your info won't be shared.